We already see strong evidence to support the contention that renewable energy can supply the world’s power needs. As explained in Worldwatch Institute, State of the World 2013, we need to move beyond fossil fuels before its too late. “Renewable technologies broke all growth records in recent years,” said Alexander Ochs, Director of Worldwatch’s Climate and Energy program, and contributing author of State of the World 2013. Despite the fact that we urgently need to transition away from hydrocarbon based energy systems, there are many who continue to deride renewables as an unstable and unpredictable source of power. In an effort to debunk the myths about renewable energy being unpredictable, Karl-Friedrich Lenz coined the term “unreliables myth”. He was responding to critics who say that wind and solar only offer intermittent energy (the wind is not always blowing and the sun is not always shining). Describing wind and solar as unreliable is inaccurate. First, photovoltaic solar and wind can be supplemented with storage capacity that enables them to provide uninterrupted power. A good example of a technique for creating storage capacity involves generating hydrogen with renewable energy which can be stored and used at will. Once you are producing large enough volumes of energy you can stockpile it and avoid concerns about intermittency. 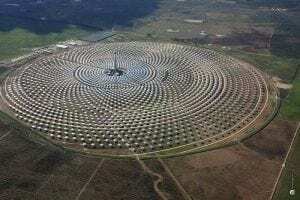 Second, even if part of the energy grid uses intermittent renewable energy without storage, as long as there are other energy sources on the grid (ie concentrated solar power, hydro, and geothermal etc) there will be no interruption of supply. Even if there is a shortage, this can be managed by smart grids, or as a worst case scenario, energy can occasionally be supplemented by hydrocarbons. Despite these solutions, many continue to be doubtful about the possibility of an entirely renewable electrical grid. The old energy industry would like to have us believe that it will take at least 50 years before we can wean ourselves off of fossil fuels. However, this is refuted by the 50 nations that are currently meeting most of their energy needs with renewables. A total of 11 countries are supplying all of their power demands with renewables and some of these have become net exporters of clean energy. Paraguay is one of those countries that gets all of its electricity from renewable energy while at the same time exporting 90 percent of its production. Renewable energy is not only clean it also provides good jobs. Albania, which produces all of its electricity with renewables, is looking to create 100,000 green jobs by 2020. The following list of countries get 60 percent or more of their electricity from renewable energy. It was compiled from data at the CO2 scorecard site. All the data is derived from this source with the exception of nations designated with an asterix, which are sourced from Wikipedia. As most of these figures date back to 2008, the percentage has in many cases increased over the last five years. It should also be noted that most of these states get their energy from hydroelectric projects, which although commonly considered a renewable energy, comes with a number of environmental concerns. Further, there are many small developing nations in this list which have limited power requirements. Nonetheless, this list demonstrates the viability of renewable energy, albeit on a small scale. Developing countries are not the only ones ramping up renewable energy. In terms of developed nations, Germany is a recent standout for producing almost half of its energy needs from solar. In the U.S., almost half of all new generating capacity installed in 2012 was renewable, and in Q1 2013, 49 percent of all new US electricity generation capacity came form solar. A number of independent researchers have demonstrated that renewable energy sources can replace fossil fuels and provide for all of the world’s energy needs. This research has also debunked claims that the emissions attributable to intermittent power production from renewable sources offer only nominal reductions in greenhouse gas emissions when compared to fossil fuels. The US National Oceanic and Atmospheric Administration (NOAA) has conducted research which demonstrates that green energy can affordably replace fossil fuels as the world’s primary source of electricity within 20 years. The NOAA’s findings add to other studies that also support the feasibility of replacing fossil fuels with renewable sources of energy. In 2011, the United Nations’ Intergovernmental Panel on Climate Change (IPCC) released a report which indicates that nearly 80 percent of global energy demand could be met by renewable sources of energy by 2050. Research published in 2009 by Mark Z. Jacobson and Mark A. Delucchi also supports the contention that renewable energy can replace fossil fuels, as does research published in 2010 by Robert Howarth. Sandy MacDonald, a director at NOAA said that wind and solar could supply 70 percent of electricity demand in the lower 48 states as soon as 2030. Together the evidence supports the notion that we can meet our energy needs with renewable sources of energy. This is not just an urgent necessity, it is also a technologically and economically viable solution to the looming threats we face.